This week Amelia and Khai interview uber-guitarist Az Samad and talk about his use of social media to write his new album 'Our Voice', his experiences overseas studying music and performing in San Francisco and how the hell he plays guitar so damn good. They also talk about possums. They talk a lot about possums. And stick around after the interview to hear an exclusive live performance by Az of a track from his new album. And if that's not enough, scroll down to watch another exclusive live performance by Az Samad of 'Salam Rindu'. That's right folks - an entertaining and informative interview, a live audio track and a live video track. We spoil you too damn much. Find out more about Az Samad at his website where you can download his new album 'Our Voice' and you can also follow him on his twitter handle @azsamad. 'Once Upon a Time The Was A Sausage Named Bob’ consists of vocalist Esty Richards, Jared Lee and his brother Lee Wei Chen, Anthony JC Lam. Come see them perform live at the Fused / WAMM film screenings on October 2nd at the Actor's Studio Lot 10. Click here for more deets. WAMM: Ok, before asking any other question, I think everyone's dying to know: how did you guys get such an off-beat name? What's the story behind it? Jared: I'll try to explain in the simplest way possible: 4 boys and 1 girl met in college. Decide to join a battle of the bands for fun. Came up with a name which they thought was funny at a mamak in Subang. Won it and won a few more after that. Name stuck. Hahaha! WAMM: Right, now that we've settled that, can you each introduce yourselves and tell us a bit about yourselves? Esty: I'm the vocalist and also the youngest in the band. My passion is to make music: live, eat and breathe it. I'm a very open minded and outgoing person. I get along with everyone pretty well. Don't let my poise fool you, once you get to know me I can be very "crack". Haha! JC: The drummer. Been drumming for about 5 years now. Everyone close to me would know I'm into food. Seriously, bribing me with food is an option! Umm, music is my passion, writing is my job (I'm working for a local entertainment magazine). Chen: The Bassist, into competitive gaming. Anthony: The other guitarist, currently doing sound for a certain company and I am a metalhead. WAMM: We know Wei Chen and Jared are siblings, but as a group, how did you guys meet each other, and why did you guys decide to form a band? JC: Actually, all 5 of us were from the same college, IACT. All of us, with the exception of Chen at the time, formed the band for a performing arts club at the college and our first song, This Is The Part, was written then. Coincidentally, a battle of the bands came around the same time and, in need of another member, Jared got Chen into the band to play bass. The rest, as they say, is history! WAMM: Tell us a bit about your music, who are your influences, and what's the song writing process like in your band? Esty: Each of us has different influences which is a good thing. Basically it's either I come up with something and I give it to the band to try it out or the band comes up with a song and I fill in the lyrics. If one of us doesn’t like the song, we'll scratch it out; we want it to be a unanimous agreement. WAMM: Do you guys have other jobs besides being in a band? Why do you have more than one job? Is it due to difficulties sustaining yourself as full time performers? Chen: The boys have jobs because being in a band locally is not enough to sustain ourselves finacially speaking. 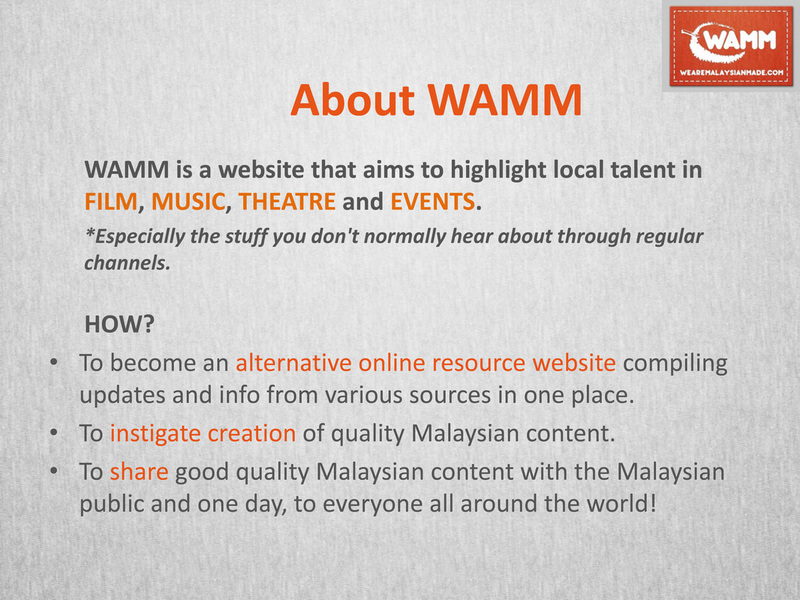 WAMM: What do you guys think is the reason for so many of our local peforming artistes to hold multiple jobs? Anthony: I guess it's pretty obvious because the industry here doesn't allow us to pursue it full-time, I think a big factor in this is because everyone needs to live, but that still doesn't stop us from pursuing a dream. The harsh reality of the industry is that you can't sustain yourself with just performing and recording. I would love to see a change, where local music is more accepted and the audience is more supportive (of local music). JC: Unlike the US or other countries where their local music is thriving, the market for local music in Malaysia is actually pretty small. So based on that alone, making money from just music alone, as a band, is not easy. WAMM: Do you think that that will change soon? Anthony: I really do hope so, if more people are receptive towards our local bands, this could change how things are. As for now, it seems rather bleak. JC: For now, we'd better keep our daytime jobs. You know, just in case! WAMM: Do you guys have any plans of going into performing full time? What is the dream or goal for the band? WAMM: Any last words of advice for aspiring creatives, especially those who have just started their own bands? Esty: The most important thing is to know the value of chemistry in the band. Have fun writing songs and everything will fall into place. Always look for opportunities to perform and work hard! Come by The Actors Studio Lot 10 on 29th September at 8.30pm to experience Baca, which is part of the Actors Studio's experimental performing arts series Fused. This month's rehearsed readings feature writers Adeline Ong, Nandang Abdul Rahman and WAMM's very own Joshua Chong, with two scripts from each writer. There will be a Q&A session after. Entry by min. RM10 donation. It's the first week of WAMMcast so here's a double dose of local goodness for your ear buds - episode two is up and live featuring an in-depth interview with acclaimed singer-songwriter and executive producer of such projects as 'Undilah', '15 Malaysia' and 'Here In My Home' together with the director of 'Undilah' and 15Malaysia's 'Meter', Benji Lim! Or is it Lim Benji? Pete was incredibly knackered by the time he came in to do the podcast and we're so grateful he managed to make some time for us out of his busy schedule to talk about stuff, even though he looked like all he wanted was sleep. But you should totally listen to the podcast, especially if you're someone who's in the creative field too, be it musician or filmmaker or anything, as the discussions on how limitations and collaborating with people out of your comfort zone is a great discussion and one that any creative person should really give a listen to. Oh, and if you haven't seen 'Undilah', what's the matter with you? WAMMcast: The 1st episode of the WAMM podcast is live! That's right, folks - WeAreMalaysianMade has a podcast, thanks in no part to Khairil M. Bahar a.k.a. Khai's fascination of all things Kevin Smith and his desperate desire to emulate the man in any way, shape or form. This inaugural first episode sees him wax lyrical with co-host Amelia Chen about 'Bunohan' being picked up by Universal, Datuk Michelle Yeoh's performance in 'The Lady', the violence of James Lee's 'Claypot Curry Killers', a review of Namewee's controversial 'Nasi Lemak 2.0', the 'questionable' reasoning behind this year's AIM nominees and why 'Suara Kami' was called 'Suara Kami'. And if you'd like to find out more about the stuff they're babbling about you can find links below to all the videos and news stories they're referring to. You can also download the episode to your computer, add it to your rss feeds or subscribe to it on iTunes as well as listen to it at PodOmatic where we host the podcast. 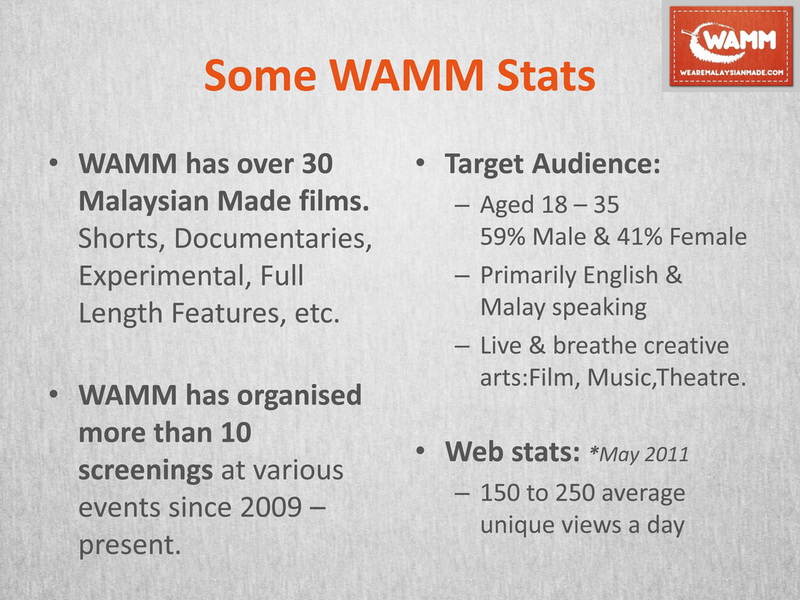 You can also come to the WeAreMalaysianMade site and stream it from our WAMMcast page. The podcast will be going up once a week, alternating between Khai and Amelia's discussions and ramblings and interviews with people from the local arts scene. However, since this is the first week of the podcast we'll be posting up episode two tomorrow which will feature an interview with multi-talented singer-songwriter Pete Teo, the brains behind 'Undilah', '15Malaysia' and 'Here In My Home' together with the director of 'Undilah' and the 15Malaysia film 'Meter', Benji Lim! So come back tomorrow and check it out because it's an incredibly cool interview, not just about Pete and Benji's work on 'Undilah' but also their creative process and how they work. So have a listen and let us know what you think at the comments section, especially if there's anything you want us to talk about or have any ideas for us. And if there are any links to things you'd like us to talk about, people you'd like us to interview or if you just want to drop us a line simply fill out the 'Got Something To Tell Us?' form at the WAMMcast page and we'll get right back to ya! We bet a lot of you had a good time sleeping in last Friday during the public holiday. But Malaysia Day (16 Sept) should mean a lot more than a day 'off-work'. Check out this little video revisiting our history by "That Effing Show". It seems the link above does not work anymore. Previous posts for RockAway Festival here : 1st post and 2nd post.